In the late 1700s scientists were making great strides in the manipulation of electricity and the public wanted in on the fun. Demonstrations of electricity were one of the most popular events of the age. For the audiences members, they were fun and amazing. But for the boys in them, there were just painful. Stephen Gray might have been the perfect example of the gentleman scientist if he had been a gentleman. Born in 1666, he was the son of a cloth dyer. Having a solid trade wasn't a bad position to be in, considering the era, but at a time when, to learn, one had to have access to materials, tutors, and a library, Gray was at a distinct disadvantage. He educated himself by having friends with libraries and a tirelessly observant nature. One of the things Gray observed was that charge can travel great distances through an object, or even multiple objects. (For example, when he stuck a twig in a charged cork, the twig was charged. When he extended the twig, the extensions were charged.) Gray lived at a time when the science of electricity, and the marvelous feats that could be done with it, excited public imagination. People flocked to see demonstrations of scientific phenomena, and Gray came up with a showstopper. The demonstration was called "The Flying Boy." A boy was swaddled in clothes, and suspended from the ceiling with silk cords. Once the boy was entirely off the ground, and away from any conductors of electricity, Gray placed a "sulfur globe" against the boy's feet. The sulfur globe was a fairly recent invention. When Otto von Geuricke came up with it in 1672, it took the scientific world by storm. Geuricke melted powdered sulfur into a globular glass mold, then, when the whole thing cooled, cracked the glass to reveal the smooth sulfur ball. He spitted the globe with a metal rod, which he used to turn the globe on its own, or rotate it against a piece of wool or carpeting. It could even be put in a wooden stand and turned like a pig on a barbecue spit while the material was held against it. Most often, it picked up its electrons from a grounded person's hand. After enough time, the globe could attract little pieces of paper or feathers. It could even, if charged diligently, send out a spark. The sulfur globe was a useful invention, but scientists had long known how to charge objects. What made waves was the globe's ability to glow when turned fast enough. It was the first demonstration of electroluminescence. 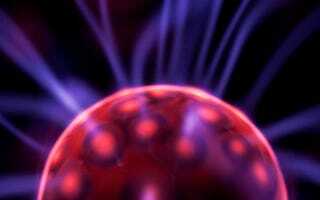 Electricity and light came together for the first time in the minds of scientists and of the public. Those members of Gray's audience who weren't prepared for it would have been shocked when the globe turning against the boy's feet began to glow with some mysterious energy. After some time, the boy would be sufficiently charged and out would come the book. Gray knew to build tension and interest in his audience. He didn't bring out his best trick right away. Holding the book near the boy's hand, Gray would ask him to turn the pages without touching the book. The boy would hold out his hand, and the nearest page of the book would float up towards it. Building on his work with the cork and the twigs, Stephen Gray would bring in a person from the audience. Standing them on an insulating stand, he would have them hold hands with the boy. Although the person couldn't feel any kind of difference in their body, when they stretched out their hand over the pages of a book, or over loose pieces of paper, they discovered they had been invested with the boy's power. Then came the finale. Gray knew that enough of a charge could cause a spark, so he had the volunteer let go of the boy, and step down from the insulator. The boy was charged up more and more, the lights were dimmed in the hall, and the person from the audience was asked to touch the boy's nose. As their hand approached the boy's nose, everyone heard a loud crack, and saw a bright spark fly between the Flying Boy and any member of the audience. If the demonstration was done in private houses or at the request of a scientific society, a child of one of the society members was used as the flying boy. Some of the time, though, street kids would be paid a bit to get hung up and shocked for the amusement of others. The Flying Boy was perhaps the most famous and celebrated demonstration of its time. People all over Europe wrote about it, and imitated it. The Royal Society of London awarded Gray the first Copley Medal, "for his new Electrical Experiments - as an encouragement to him for the readiness he has always shown in obliging the Society with his discoveries and improvements in this part of Natural Knowledge." The Copley Medal, "for outstanding achievements in research in any branch of science" is still awarded every year.